If you have been reading my articles for the TI99/4a Home Computer you will have realised my interest in strange graphics. Moving on to a modern PC, there isn't too much available to allow you to have fun with these little programs, but at last I found a very old language- although far more recent than the 1979 TI Basic. This is sdlBasic, a cross platform language (Atari, Windows, Mac, Unix (Linux) etc. There are 2005 and 2007 versions and even a 2012 version but the one I landed on first was the Mandriva 2010 build of the 2004 version. Speedy and easy. There is a 2005 rpm build on Sourceforge but that one caused me problems, whereas the 2007 rpm build also from Sourceforge (not apparently built for any particular Linux distro) went in like a treat and is the one I now use. At the time of writing there is no rpm package of the 2012 version. There is a discrepancy between my sdlbasic and the documentation- in theory rnd() should return a number up to 999999999, but in practice it returns a number up to 32 bit signed maxint. To solve this I have used rnd(999999999) instead of rnd(). Anyway, on this page I will place my sdlBasic versions of TI Extended Basic graphics programs. Probably fairly easy to adapt these to other languages. The small images are portions of the displayed screen.
' sdlBasic (Windows, Unix etc etc) -requires SDL.
' also see "wallpaper on your screen"
ESCape key to exit, any other key to zoom. Where do the circles come from? There is no use of sin, cos or tan etc. gingerbread man This chaotic set was described by Robert L Devaney in the Springer-Verlag book "The Science of Fractal Images" (1988) (see p 149, section 3.2.3). 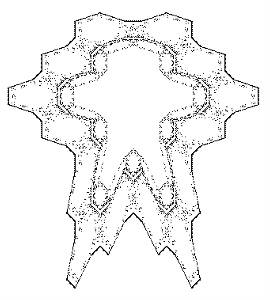 My code is based upon "Ginger Bread Men" by Tom Marlow, in Fractal Report issue 10 (August 1990). Also to be found in "The gingerbreadman" by Robert L Devaney in Algorithm 3.1 (January 1992). Notice that sdlBasic supports numerous alternatives, so you can use WEND or END WHILE. You may also choose to use NEXT or instead use END FOR - and they have the same effect. Random Biped Just using a WAITKEY below ran the loops too quickly, and there isn't an easy way to see if a new key is pressed - except that as the keycode is passed when a key is RELEASED we can test INKEY<>0 after the WAITKEY, and move the test for the ESCape key to this section, wrapping the whole in a simple DO...LOOP. Notice that there are two ENDs! There must be one at the end but you can otherwise have them anywhere.
' seems best between 6 and 9 but try anything! 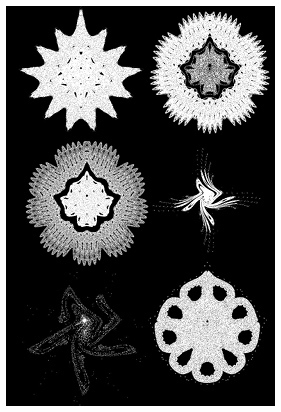 Starry Shapes The first listing is from "Complex Curves from Simple Math" by Rastislav Telgarsky published in Volume 3 (August 1988) of The Journal of Chaos and Graphics (Ed: Clifford Pickover). 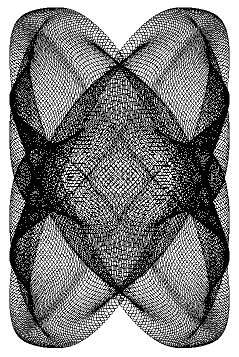 Producing a similar graphic but instead of using I*SQR(I*J) here we use I^2*J -this variant is from Clifford Pickover "Computers Pattern Chaos and Beauty" page 324. Random Attraction Playing around with these little programs can be good if simple fun. Here is a variation on the above which allows random images with zoom in and out. In this case to demonstrate the variety better, click on the top thumbnail for a larger image. 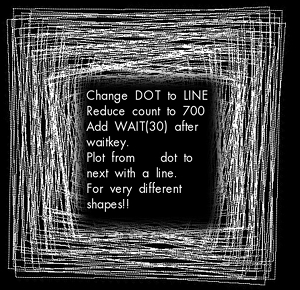 If you have a fast computer or good patience, see what happens when you increase the number of dots plotted (the limiter on the variable N)- sometimes the image is stable very quickly, sometimes after a number of plots it will suddenly grow another layer. Some images will only have a few dots, just go on to the next image. 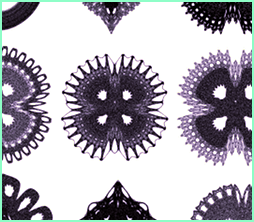 Tiny variations in coding can result in quite different results. Try this one. 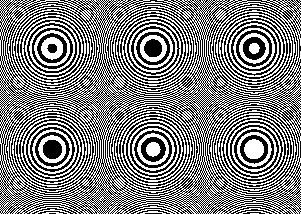 Egg Tile Generation We are here defining the size of the graphic and then filling it in, so zooming in and out does not affect the pattern, and is rather pointless! 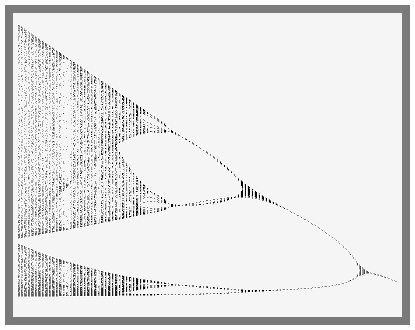 However some interesting patterns from quite a short code. 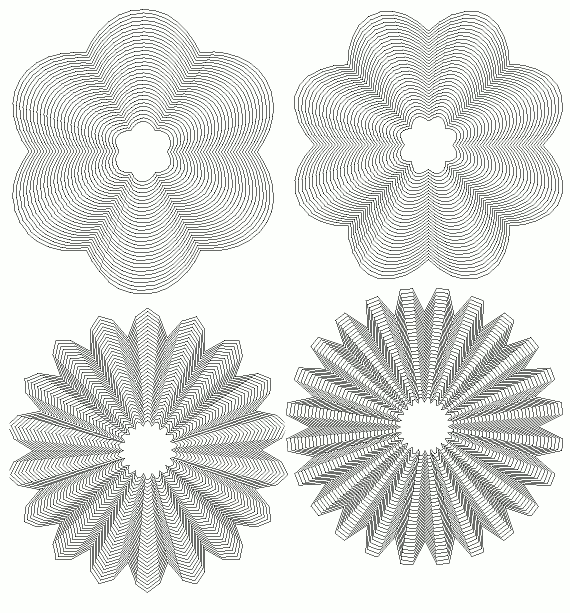 Try very small variations of each of the variables in turn, one at a time. 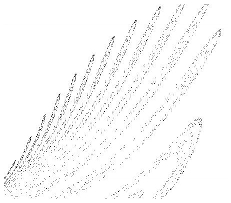 r= number of pixels down and across of pic. g= frequency of sine wave, main pattern determinator. 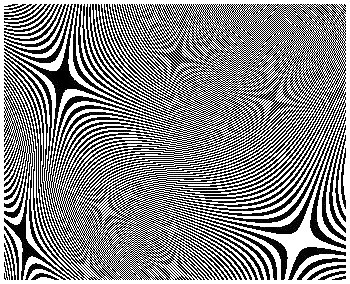 m=modulus, degree of pattern density- m low=more pixels on. 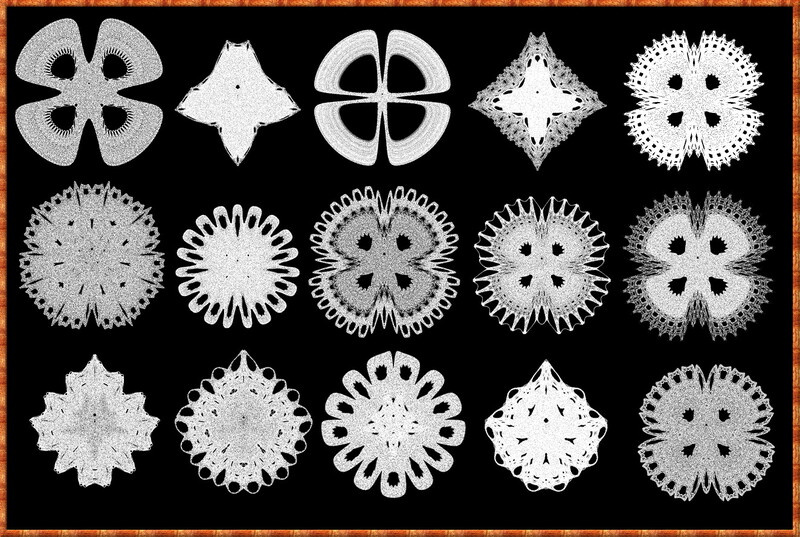 Also affects pattern. 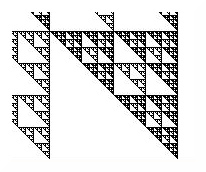 Feigenbaum Diagram Based upon Fractal Report Number 10. - total 320 subscribers. (Volume 2 no 10 First published August 1990. published by Reeves Telecommunications Laboratories. Publisher John de Rivaz placed the available text freely available online on Geocities). Issue 10 is the one with the front cover autograph by Arthur C Clarke. 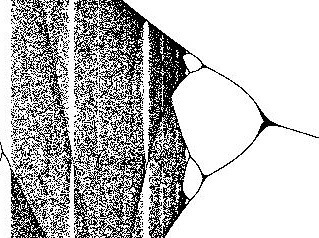 The next program is based on work by M Feigenbaum in 1979 and produces some interesting pictures, depending on the limits you set when the program starts. Sometimes looking VERY closely (maximum magnification) will produce an interesting result, at other times it pays to stand back a little. 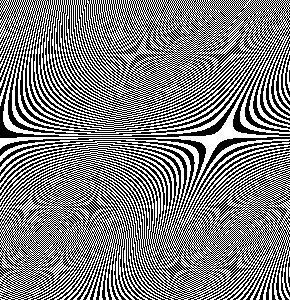 Towards the bottom of the overall plot is chaos, on which can be found some overlying non-chaotic detail. Fluted Scallops Click image for larger version.